The latest herb to find its way into my blender is the lovely rosemary. Most people have cooked with rosemary, but have you tried it in a smoothie? In case you’re new here, I’m a huge proponent of improving the taste and increasing the nutrition of smoothies by incorporating various spices and herbs. Rosemary is quite easy to grow at home if you’re into that. I actually got a small bundle of sprigs from my CSA (community sponsored agriculture) last week. Pretty impressive list of health benefits for something so cheap and easy to add to your smoothies. 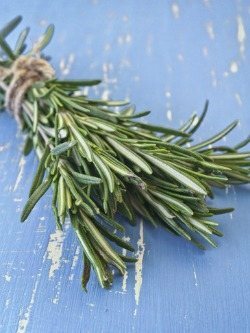 I chopped up the leaves from a sprig of fresh rosemary – the dried herb will work just as good. I encourage you to experiment with other herbs such as sage, basil, cilantro, and mint. See the list of Herbs and Spices on my Smoothie Recipes by Ingredients page for more ideas. Put all of these lovely ingredients into your high speed blender and blend for around 30-45 seconds or until your desired consistency is reached. I’d love to know if you tried and enjoyed this rosemary green smoothie – please do tell in the comments below. Happy Blending! For more information on remarkable rosemary, see this excellent article. Funny enough I put Rosemary in my smoothie the other day, fresh from my Nans garden. It Woz very bitter an left a strong taste in ur mouth! Will continue to use it in my smoothies from now on jus for the fact tht it is doing my body a world of good. A little rosemary goes a long way. Maybe cut back on how much you’re blending to reduce the bitterness.